Australia day is here for another year, along with painted faces, flag flying, boxing kangaroos and, of course, companies trying to leverage patriotic feelings for their brand’s benefit. Coles and Woolies are fighting it out to prove who is ‘more Australian’, Vegemite has renamed their famous spread to ‘Australia’ and Lamb has again released their annual Lambassor, Sam Kekovic, for another ripper viral session – this time trying to get him the number 1 on the pop charts. But this year, it is Wine Australia that has caught my attention with their idea to ‘de-stride’ those drinking foreign vino. Aussie Wine is suffering. The Australian Dollar combined with the fledgling European economies has caused a flood of cheap imports, making European wine cheaper than ever. It seems quite ironic, after years of investment to dispel the image of ‘cheap plonk’ and ‘wine casks’, Australian wine has a reputation of being ‘too expensive’. Aaron Brasher, Regional Director of Wine Australia, believes Australian wine brands, like many Australian made products, are under attack. Australia Day is the perfect opportunity to get us to rethink what we drink. “It makes sense to drink Australian wine while eating Australian produce, watching Michael Clarke and the Aussies do battle with India and wearing as many boxing kangaroo emblazoned items of clothing as possible,” Brasher said. Wine Australia’s PR convinced The Age and Sydney Morning Herald to sell their message and they were impressed by the ‘campaign’. “Wine Australia wants Australians to stick to Australian wine on Australia Day and, if they catch someone drinking an offshore drop, to ”pull down their strides” reports Ben Butler and David Fickling. What a ballsy idea! Eager to see how this has been executed, I trawled through various media, including Wine Australia’s website, twitter and Facebook pages. But all I could find was a very safe and uninspiring promotion for “A+ Australian Wine Celebration”. Unfortunately this just lacks any of the Aussie wit and cut-through of the ‘de-striding’ idea. 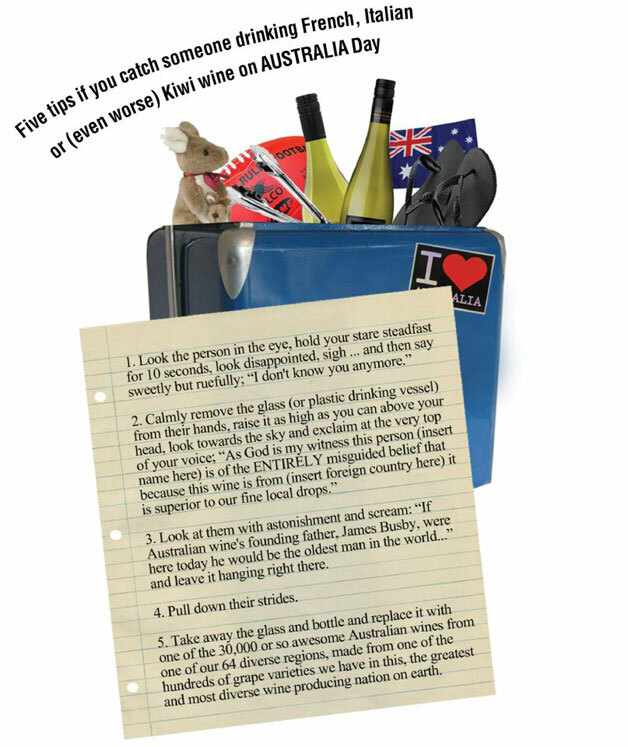 Finally, after searching their Facebook site I found an image for the ‘five tips if you catch someone drinking French, Italian or (even worse) Kiwi wine on AUSTRALIA day’ – which includes the clincher in point 4; “pull down their strides”. Not exactly a campaign! What a missed opportunity to really get their message out there in a truly Australian way. Maybe they got a little shy and were worried about really dropping their pants. With the usual suspects of Aussie rock being played to death at many barbies, I thought I’d get in first. I know it is un-Australian to admit it, but I was never a fan of Cold Chisel. However, I couldn’t pass the thought of Jimmy Barnes belting out “Cheap wine” at the very parties where people will be ‘de-striding’ those quaffing overseas wine. ‘Summer Wine’ ad from 1983 – hence the ‘cheap plonk’ reputation! In the aftermath of the recent Rudd-Gillard leadership debacle within the Australian Labour party I think it’s fitting to take look at some of the best political branding moments.